II exposure to health and safety hazards in the workplace can be prevented. But only if the systems for initiating and monitoring controls are as carefully planned and implemented as the controls themselves. For proof of this, look no further than the participants in OSHA's Voluntary Protection Programs (VPP). Meeting the VPP requirements and following guidance provided by OSHA's onsite evaluations, VPP members maintain comprehensive, practical,verifiable safety systems involving employees and managers at all levels. The results have been spectacular--members routinely report lost time injury rates of 50 to 80 percent below industry averages. These remarkable voluntary programs were developed and managed by Margaret Richardson for OSHA. Now Richardson uses her experience with VPP Star sites and clients pursuing excellence to take you beyond the VPP requirements to levels achieved by the best of the best. is the first how-to guide to establishing effective management systems for achieving excellence in worker protection from workplace hazards-a chance to benchmark the industry leaders from the comfort of your favorite chair. is based on OSHA guidelines for managing worker safety and health and on Richardson's considerable hands-on experience with OSHA and Department of Energy Star sites, as well as client worksites in some of the largest firms in the world. 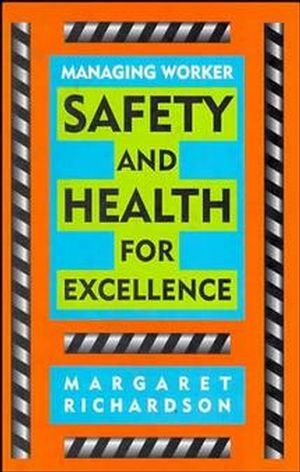 Step-by-step, the book shows you how to Achieve a closed safety management loop with clearly established policies, goals, objectives, assignments, and accountability procedures Ensure total worker involvement by fostering a "safety culture" where employees feel ownership of the safety/health program Identify and control hazards with a "hazard inventory" plus other reports, investigation techniques, and analyses to pinpoint all kinds of problems--even those that often elude controls Train all levels of employees, from workers and supervisors to middle and top managers, to understand their crucial roles in the program Better safety management up-front means fewer on-site accidens and work-related illnesses plus improved employee morale, more efficient operations, and better public relations. If you are responsible for creating, teaching, managing, or monitoring sophisticated safety systems, or if you serve on a safety committee overseeing safety systems, provides the information you need to do the job right. Margaret (Peggy) Richardson is the President of Richardson Management Group, Inc., a safety and health management consulting firm, with a client history including Mobil, the Department of Energy, OSHA, Reynolds Electrical and Engineering, Austin International, Whirlpool, General Electric, and Westinghouse. The first Executive Director of the VPP Participants' Association, Ms. Richardson has over two decades of experience at the Department of Labor--17 year With OSHA. The Voluntary Protection Programs (VPP) and Excellence. CLOSING THE MANAGEMENT LOOP: A STRUCTURE FOR ZERO-DEFECT MANAGEMENT OF SAFETY AND HEALTH. Setting Objectives for the Safety and Health Program. Making Accountability Work for Safety and Health. Evaluating Safety and Health Program Effectiveness. ACHIEVING TOTAL INVOLVEMENT IN WORKER SAFETY AND HEALTH. Ensuring Line Employee Ownership of the Safety and Health Program. The Challenge for Safety and Health Professionals. SYSTEMS APPROACHES TO ANALYZING AND PREVENTING OR CONTROLLING HAZARDS. Supplemental Tools for Hazard Control. LEARNING TO OWN SAFETY AND HEALTH. Author's Afterword: The Future of Excellence.